How To Create A Cutting Garden. Step One. Straight seed drills…good work Mr Higgledy. ‘Where To Site Your Cutting Garden And How To Prepare The Beds’. *First off the majority of the flowers you will want to grow in your cutting garden will be sun worshippers…so clearly you will want to make sure your site gets heaps of sun…at least 7 hours is best. Keep well away from trees too…the pesky blighters will slurp up all the precious water and nutrients and may well shade your patch when your not looking. *Talking of water…it is preferable to be near your water source. *Avoid windy sites. If this is not possible then be prepared to put up wind bashing fences or ‘wind fabric’…the later looks tacky but does the job well enough. *Many experts in the field will tell you to hide your cutting garden as it is a productive garden and as such can look ugly. This is complete rubbish…cutting gardens look amazing at all times….even when they just get up. ‘…my mistresses eyes are not like the sun’. I would live slam bam in the middle of mine if I could…and one day I shall. *Fertile soil is best…although it doesn’t have to be rich soil as soil too high in nitrogen will produce lots of foliage but few flowers. 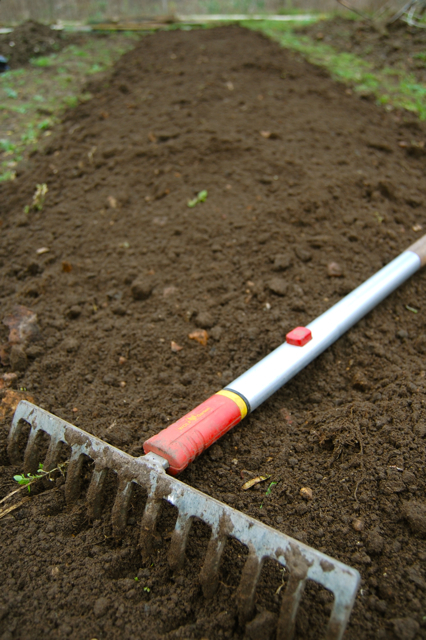 A heavy clay soil should have some sand or grit dug in, along with some organic material to aid with drainage. A sandy soil will be helped along with some compost added to improve its water retention. Leaf mulch is a great organic ‘bulker’ to add to your beds. If your soil is utterly, mind blowingly poor then why not knock up some raised beds and buy in some top soil…if you buy it in bulk it won’t break the bank. Raised beds are also useful if your ground has drainage issues. *The Higgledy Garden method for producing a cutting garden is to have beds of whatever length you desire or have room for and a width of approximately a metre…(three feet). This will allow you to be able to reach the centre of the bed from either side without treading on the bed…which is a no no. 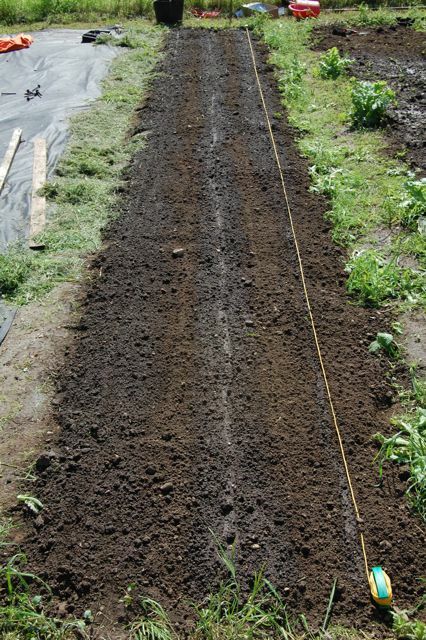 A solid rake will bring the soil down to a fine tilth. *Paths can be whatever width you like…but make sure they are wide enough for a wheelbarrow…I usually have grass paths and make them the same width as my mower…because I’m smug n clever. You can also use bark or gravel etc. How To Create A Cutting Garden In Four Steps. How To Create A Cutting Garden. Step Two. I have received my ‘autumn pack’ seeds yesterday. I am keen to get going now! Can I plant all the autumn seeds in my outdoors beds now or am I too late? Was just thinking I’d like to do a cutting garden for next year…. Love your practical tips on successful gardening. They will go a long way in helping me to be more productive.